Stun your family and the whole campground with the beautiful 2019 Starcraft Launch Outfitter 31BHS! You'll love every journey made with this Travel Trailer! You can find this model and other top quality RV brands over at RV World MI, located in Grand Rapids, MI! You can stop by our lot at 7834 S Division Grand Rapids Michigan 49548 or give us a call at 616-591-3632 to talk to one of our RV experts! Enjoy the comfort of home while you're on the road! The master bedroom is comfy and private, and features a spacious Queen bed! Up to 9 people can sleep comfortably inside this cozy camper! Love to cook for your family, but hate juggling fry pans, pots, and everything else over a campfire? Then you'll love the big, fully appointed kitchen! Use the 3 burner range cooktop to make eggs, bacon, burgers, steaks, chicken, fish, flapjacks, and more! And keep everything handy and fresh in the roomy 6.00 cu. ft. refrigerator! You'll have enough refreshing, clean water for your family's needs with the massive 68 gallon freshwater tank! Nothing is more convenient than having a full bathroom at hand so you don't have to trek through the campground to the chilly, damp, often crowded public restroom. Well, rest easy in the spacious, delightful bathroom in this Travel Trailer! It comes complete with a modern shower and sleek Foot Flush commode! This RV also has a 62 gallon gray water tank and a 31 gallon black water tank. 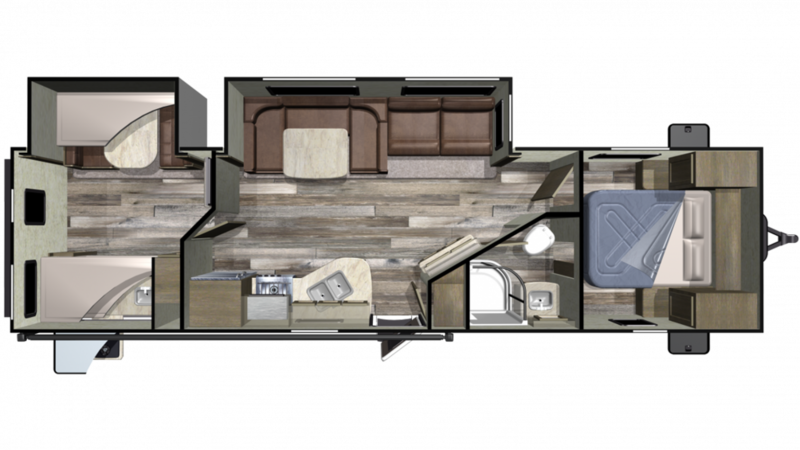 There are so many cozy options to sleep in at night, with 3 beds found around this RV! You'll find several in the bunkhouse, which holds extra comfy Bunkbeds! Make some great lunches outside in the sun and fresh air with the outdoor kitchen!